Leads by text is a new way to get more reliable leads. With Leads by text you can get *INTEGRATION WITH SALES FORCE*MOBILE TEXT MARKETING*BULK SMS*MOBILE KEYWORDS*TWO WAY TEXT MESSAGING *POWERFUL TOOLS AND UTILITIES*MOBILE COUPONS *MOBILE VOTING*TEXT TO SCREEN*APPOINTMENT AND REMINDER SERVICE* MESSAGING OPTIONS*ONLINE SIGN UP PAGES This form of lead generation can be used on any form of advertisements and put together with lead boxes and take ones you can increase them amount of leads you get a week. 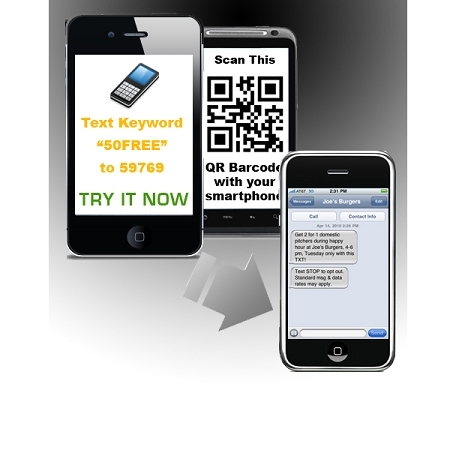 QR Codes are free when using our Leads by Text Program. Your Contest Box. 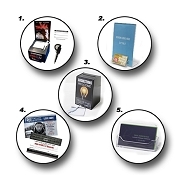 Sign Holder, Poster or Guest Pass will display your "Promotion" along with your "Short Code" and "Keyword." Example: To Receive A Special Bonus, text "11111" and enter keyword "Offer" to Receive A Special Bonus Gift." Your interested lead's "text in" to get your offer. Once they "text in" they receive an Automated reply from your texting platform. This reply is created by you. You can include a link to your website or request additional contact information if wanted. You get notified via text when a lead comes through. Your monitoring is done completely through our website, www.LeadBoxTexting.com. Log in and you can retrieve new leads, create and send appointment reminders, and create mass text messages to send to you database. Once they text in they are automatically put on your text message list for future follow up. 3. Appointments reminders to help decrease No-Shows. 4. Pre-programmed custom text messages to send out on scheduled intervals. Automated New Member Alerts Automate a series of text messages over a selected period of time to welcome and communicate goals with new clients.